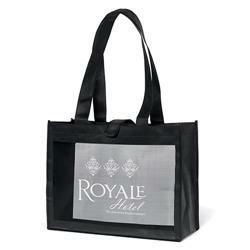 Be on trend and eco friendly with our Royale Mesh Panel Tote Bags. Our shopper tote is made of 100 GSM premium non-woven polypropylene and features front and back mesh panels, 2” wide by 28” long handles, and a wide hook-and-loop strap closure. Display your company or school logo with our large imprint area and the wide gusset is roomy for all your convention handouts. 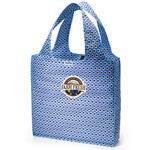 Our Royale Mesh Tote is Eco Friendly with its 20% post-industrial recycled content. A functional bag for conventions and tradeshows as well as the beach and festivals! Available Imprint Options: Screen. Price includes a one color imprint. 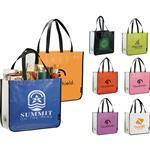 Full color printing is available and additional. Please inquire. Featuring front and back mesh panels, 2” wide by 28” long handles, and wide hook-and-loop strap closure.